We want YOU in our KREWE! We welcome you join us to ride with us for one or more parades. We now offer an annual membership for those wishing to parade throughout the year. Group discounts are available. 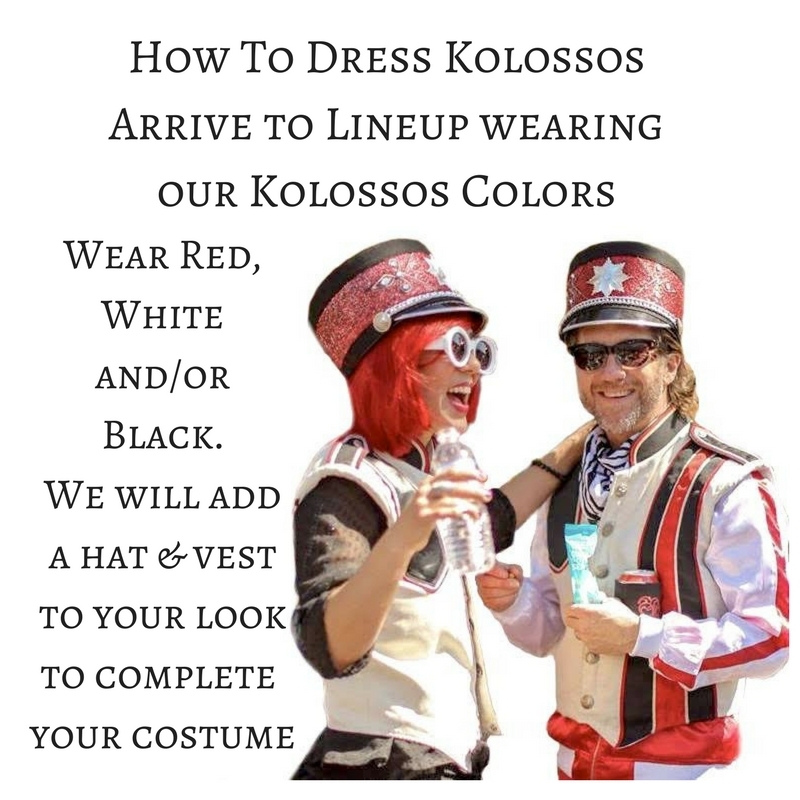 Please inquire by contacting our Captain at kreweofkolossos@gmail.com or 504-905-2830. $250 per person. Group discounts available. Animal art tricycle, marching band vest and hat, snacks and water, sunscreen and first aid kit, emergency rain gear, DJ and dancers, portolet. Delivery of tricycle to lineup and pick up at the end of the parade. Attendants to assist you before and during the parade. The Krewe of Freret parades down historic St. Charles Avenue from Uptown to Downtown. The parade begins at Napoleon Avenue and finishes at the Convention Center. We will begin the day at noon when we check in, receive our costumes and a bike lesson. Then we will have time to hang out with the other members, grab a snack at the grocery next door or check out all the other groups warming up around us. Once we begin, we will enjoy over 4 miles of excited parade goers cheering us along the way. The Kolossos Bike Zoo is a parade favorite for all ages. Space is limited to 20 riders. $300 per person. Group discounts available. Animal art tricycle, marching band vest and hat, snacks, water, sunscreen, first aid kit, emergency rain gear, DJ, dancers and portolet. Delivery of tricycle to lineup and pick up at the end of the parade. Attendants to assist you before and during the parade. The Krewe of Muses parades down historic St. Charles Avenue from Uptown to Downtown. The parade begins at Jefferson Avenue and finishes at the Convention Center. We will begin the day at 4:30pm when we check in, receive our costumes and a bike lesson. Then we will have time to hang out with the other members, grab a snack at the grocery next door or check out all the other groups warming up around us. Once we begin, we will enjoy over 4 miles of excited parade goers cheering us along the way. The Kolossos Bike Zoo is a parade favorite for all ages. Space is limited to 20 riders. Animal art tricycle, marching band vest and hat, snacks, water, sunscreen, first aid kit, emergency rain gear, DJ, dancers, portolet. Delivery of tricycle to lineup and pick up at the end of the parade. Attendants to assist you before and during the parade. The Krewe of Tucks parades down historic St. Charles Avenue from Uptown to Downtown. The parade begins at Napoleon Avenue and finishes at the Convention Center. We will begin the day at 10am when we check in, receive our costumes and a bike lesson. Then we will have time to hang out with the other members, grab a snack at the grocery next door or check out all the other groups warming up around us. Once we begin, we will enjoy over 4 miles of excited parade goers cheering us along the way. The Kolossos Bike Zoo is a parade favorite for all ages. Space is limited to 20 riders.